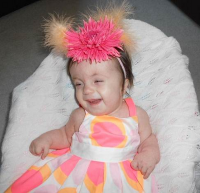 Please read my latest blog comment on Lilliana Dennis who lives with Trisomy 18. The latest – Facing Life Head-On TV show is entitled – Hope for Lilliana. This is truly a fantastic show because it shows how well Lilliana is doing, it proves that Trisomy is not “Incompatible with Life” and it shows the joy the Dennis family have while caring for Lilliana. Last week I wrote a blog comment about the recent study that was published in the Journal Paediatrics that found that children with Trisomy 13/18 are happy and the parents of these children indicated that their lives are enriched by caring for these children. The study is very realistic because it also indicates that caring for a child with a disability is not easy. It is my hope that attitudes towards children with disabilities will change and that people will be willing to welcome children with disabilities, rather than deny them treatment, care or life.